Seeing as I quite enjoyed Clockwork Angel —almost more than I care to admit —I excitedly picked up this one, eager to know what was next for Tessa, Will, and Jem. True love is shrouded in secrets and lies. With the help of the handsome, tortured Will and the devoted Jem, Tessa discovers that the Magister’s war on the Shadowhunters is deeply personal and fueled by revenge. To unravel the secrets of the past, the trio journeys from mist-shrouded Yorkshire to a manor house that holds untold horrors. When they encounter a clockwork demon bearing a warning for Will, they realize that the Magister knows their every move and that one of their own has betrayed them. 1. Characters that feel like they are real. In Clockwork Angel, you only had a glimpse of what each of these characters have been through. In Clockwork Prince, you come to realize that each and every character mentioned, not only has a backstory, but a fully developed and emotionally laden past. This only adds to the draw and connection the reader has for these characters. In the first book, you were fond of the ever gentlemanly Jem Carstairs, intrigued by the enigma that was Will Herondale, and emboldened by the strong Tessa Gray. But this book is that times about a thousand! For your fondness for Jem turns into down right love and affection. Your piqued curiosity for Will turns into blazoned passion and excitement. And finally with Tessa, your feelings of emboldenment turn into strength and a fierce passion to live rightly and fully. It’s just amazing how these characters (among countless others found in this novel) can make you feel so keenly on various subjects ranging from truly loving people to such a degree that you sacrifice your own feelings, to simply trying to figure out where you came from and who you are as a person. These characters are so extremely raw and real in this book that you cannot walk away unaffected. Relationships between characters (both platonic and otherwise) are explored in this novel. I will not say between which characters relationships progress, but I will say that the way that Cassandra Clare slowly (but not too slowly) reveals emotions, information, thoughts, etc., are written with such directness and fluidity that it feels that these relationships make sense. I cannot say that for all YA literature. More specifically, relationships between siblings is seen in a number of instances through Gideon and Gabriel Lightwood, Tessa and Nathaniel, as well as a set of characters who shall remain unnamed for spoiler purposes. Seeing such growth and development is pleasing not only to me as a reader, but to me as a writer as well. It is hard work to write such realistic relationships. 3. Love and other such drugs. Drugs are also talked about extensively in this novel, due to Jem’s dependence on them. However, it goes into something much deeper than just Jem’s understood addiction. Jem relies on these drugs to live, much like we would depend on prescription drugs in modern society. Yet, Clare also takes advantage of showing each side of the drug use. One shows how the same drug (yin fen) makes certain types of Downworlders more effective when they work -more alert -much like our ADD medication works today. And even further Clare shows and discusses how yin fen is used as an escape from reality, much like opium. The reader sees the effects of each type of usage. None are positive, for even Jem’s usage is seen as an obligatory necessity. This was a fantastic novel. Period. I was completely blown away by the characters and the emotions invoked by these characters. Phenomenally written. There were even some really great lines that took my breath away. The only negative thing I have to say (which makes me sad) is that I felt that she began to add too many quotations from classical authors in this novel, or she pointed them out a little too much as if to say, ‘Hey look at me, I read The Rime of the Ancient Mariner!’ Though I thoroughly enjoy read quotations from classics, it just rubbed me wrong for some reason in this novel -it became almost too direct. However, her beginning chapter quotations were spot on and even made me tear up a couple of times because of how poignant they were to the characters. Overall, fantastic read! 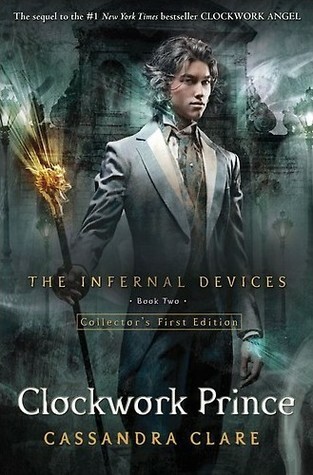 I can’t wait to finish out the series with Clockwork Princess.